If your girlfriend fancies exquisite flowers, you should buy her an elegant bouquet of tender alstroemerias. These extraordinary beautiful flowers will draw everyone’s attention, these bouquets will ideally suit weddings, interior decoration and as a gift for any occasion. Where you can buy the flower masterpiece? You can buy a bouquet of delicate alstroemerias in ASAP internet shop. We offer the best prices, quality and a large choice of extraordinary beautiful flowers. ·You can buy this exotic flower as unique gift to congratulate a man. ·These fragile flowers will perfectly suit wedding bouquets. ·Send them as a gift to your relatives and friends because they symbolize friendship. 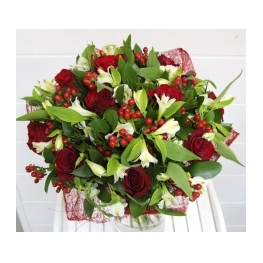 ·You can wish good and prosperity with a well-made arrangement sent to a chief or business partner. ·The Incas believed that only alstroemeria could melt the ice in the heart of an haughty woman. The florists adore this exotic plant for it’s richness. You can buy bouquets of alstroemeria or it's combination with sunflowers, roses, calla lilies and chrysanthemums on the ASAP website. t·Remember the alstroemeria’s being sensitive to the sun. ·Change the water every two days. ·You may add a bit of citric acid, vinegar or ammonia liquid to water. You can see the price in the catalogue of flowers.